Awesome Mag is a fully Responsive News/Magazine Blogger Template suitable for photography blogs and other general blogs and sites. 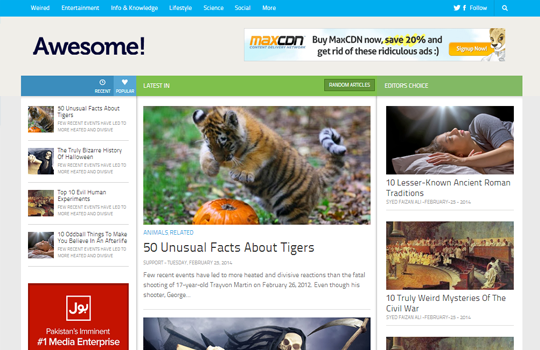 It is designed by templateism for blogger / blogspot blogs. It is finely designed with pleasent colours and look with 3 column homepage and 2 column post-page layout. Tags: Awesome Mag Responsive Blogger Template free download, blogspot template, free premium blogger template download, best template, responsive design, 2 column, 3 column, Light colour, green, blue, free download xml, zip, Easy download, Fast loading blogspot theme, seo friendly, search engine optimized News Magazine Blogger Template.